Community Board 12 is eligible to apply for a reduction in alternate side of the road parking regulations due to its two year above 90 percent street cleanliness ranking. 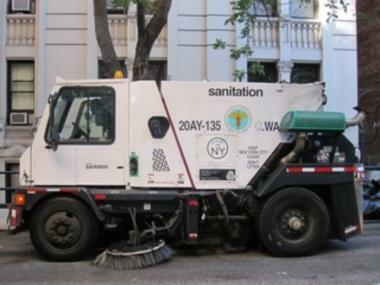 UPPER MANHATTAN — Community Board 12 voted Tuesday to ask the Department of Sanitation to curb its street cleaning services uptown by one day-a-week. The resolution, which passed 25-12-1, is the first of its kind to be passed by a community board in Manhattan. Earlier this year, the city passed a bill allowing community boards to request the reduction so long as they could show their streets have maintained a 90 percent cleanliness rate. Those in favor argued the new rule would make street parking easier for drivers who abide by alternate-side parking regulations, while those opposed said dirty neighborhood streets are problematic even with four weekly cleanings, and would only get worse with fewer. The resolution reasons that because the district has maintained a street cleanliness rating of more than 90 percent for the past three years the area can do without the typical cleaning schedule. But Cheryl Pahaham, CB12’s vice chair, argued that a neighborhood that suffers from an epic rat problem, filthy streets and sidewalks with overflowing trash, and food grease from street vendors commonly spilled out on sidewalks and streets, could not afford to limit cleaning services. “I don’t feel with our current habits the way they are that we’re ready to ask the Department of Sanitation to reduce the amount of times we clean,” she said. Others claimed that the tactic seemed a thinly veiled attempt on the city’s part to cut spending. “This is a transparent attempt by Bloomberg to save money and our streets will be filthier,” said traffic and transportation committee member James Berlin. CB12 member Zead Ramadan argued that asking the city to reduce services in a historically underserved community just made no sense. Yet the majority of the board maintained that the new rule would increase health benefits for residents, as it would limit idling cars waiting for parking spots to open during weekly street cleaning times. Some argued that the benefit to drivers is more than enough reason to support the resolution. “I felt I’d be charitable to car owners and that’s what this is all about,” traffic and transportation member Mitch Glenn said about his vote in favor of the measure. City councilmen Ydanis Rodriguez and Robert Jackson voiced support for the resolution, contending that new plan would be worth a try if it could alleviate the burden of alternate side regulations for drivers and possibly improve asthma rates by reducing the emissions of idling cars. “This is a trial effort to see if we can handle it,” Jackson said at the meeting, adding that the department would reinstate the city’s regular cleaning schedule if street cleanliness dropped. Both Jackson and Rodriguez have launched street cleaning intitiatives this year. CB12 district received a 95.9 average rating for street cleanliness, the same ranking Manhattan streets received on average this year, according to the Mayor’s Office of Operations. More than half of Manhattan’s community board’s ranked higher than CB12 in terms of street cleanliness, including Community Boards 2, 4, 5, 6, 7, and 8.